"We Don't Stop Hiking Because We Grow Old, We Grow Old Because We Stop Hiking." 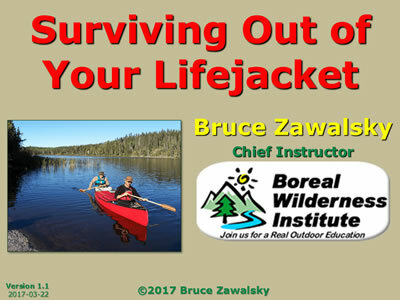 BWI provides a number of Specialized Lectures designed for Outdoor Clubs. These are all Presented by our Chief Instructor Bruce Zawalsky and take less than 1.5 hours to present. This includes ample time for Questions and an Equipment Show & Tell at the end. Cost for added this event to one of your Evening Club Meetings is only $100 Dollars + GST ($105.00), which includes the Presentation and Mileage up to 100km from Edmonton. 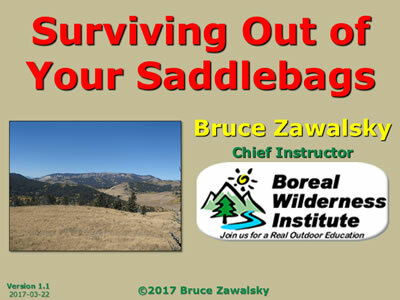 Our Custom Presentation include “Surviving out of your Day Pack”, “Surviving out of your Lifejacket”, and “Surviving out of your Saddlebags.” If you are interest Contact Us Directly and Get the Answer to the Question, What if I Had to Survive? Outdoor Clubs and Volunteer Trail Organizations are one of the few strong areas in the outdoor community. Despite Boom, Bust, and Echo most Outdoor Clubs remain stable or have grown over the last few years. It takes dedicated individual to make a club grow, but there are hundreds of hard working individuals right across the country making the outdoor clubs and trail organizations grow and prosper. Take the time to join your local outdoor club or volunteer trail organization. Your Help can make a Real Difference to the Continuation of Outdoor Recreation in Canada and the creation of excellent hiking trails across our country by the simple act of joining your local outdoor club. 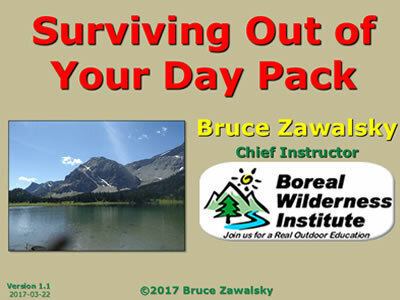 Presently the Following Clubs Receive a 10% Discount on the Survival Core Seminar, Navigation Core Seminar, and the Wildlife Awareness Seminar. Club Members Must Show Valid Membership Card when Paying for the Course.